Jodi Picoult , an American author was born in Nesconset on Long Island. Her family moved to New Hampshire when she was 13 years old. She studied writing at Princeton University, and graduated in 1987. She published two short stories in Seventeen magazine while still in college. 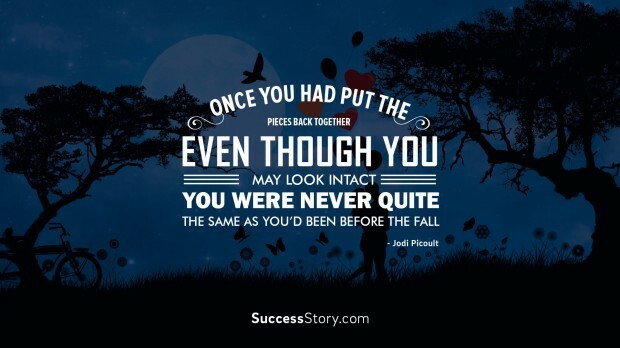 "Once You Had Put The Pieces Back Together Even Though You May Look Intact You Were Never Quite The Same As You'd Been Before The Fall"
Jodi Quotes refer to disappointments in life and how to move on through them towards greater peace and prosperity. Her contention has always been that it is one thing if you make a mistake but worst is to keep repeating it. So one must recollect oneself and restart with caution as you have already lived through the failure once. Her quotes are general in nature but very pointed at the same time with in depth meaning. She quotes that everybody has the right and should be able to believe what they want or need to believe . She is a writer and on her write-ups she gets many views from critics positive as well as negative view . You are bound to get some good reviews and some bad reviews too , one must acknowledge that who writes for the reviews and there is no need to be disappointed . These are critics and there is always a love hate relationship here. The quotes say , how far we are willing to go for the people we love because it is Love that changes the way we think and it is that thing which takes you out of what your normal set of beliefs would be.